Breakfast! Break that frickin’ fast! But seriously, breakfast is important and people should make it a priority to eat it every day. If you don’t have a hearty appetite in the morning — try this blueberry nice cream and chia pudding parfait that I whipped up. It’s light and refreshing, but filling enough to keep you going until lunch. This recipe is vegan, gluten-free and raw. Chop bananas. Place in plastic bag, then leave in freezer overnight. Whisk together coconut milk, maple syrup and vanilla in large bowl or plastic storage container. Add chia seeds by the tbsp, stirring vigorously with spoon to prevent unwanted clumping. Cover bowl with cling wrap and leave in fridge overnight. Next morning, stir chia pudding then place back in fridge for 1-2 additional hours to help it further thicken. Next, make the nice cream. Remove frozen banana chunks from freezer. Using a food processor or blender, combine with 1/2 cup blueberries until smooth and creamy. Be careful not to over blend or else you’ll get a smoothie — which is also good, but not quite the goal here. When ready to serve, scoop chia pudding into mason jars or clear bowls by the spoonful. Layer with the blueberry nice cream, or top with remaining blueberries. Serve chilled. Makes 2 meal servings or 4 snack servings. Enjoy! French toast makes me think of the happy, sleepy Saturday mornings from my childhood. Whisking eggs myself to impress my mum, reading the comic strips in the newspaper, and inevitably taking a nap in front of the TV as the result of a sugar coma. I figured this was something that’d be hard to veganize, but it was actually really easy! The hardest part was getting the gluten-free bread to stay together, TBH. Banana makes an excellent egg replacement and adds some extra flavour. Watch the video to accompany this recipe filmed and edited by Zachary Risinger below, then get cooking. In medium mixing bowl, mash banana. Add almond milk, maple syrup, vanilla extract and cinnamon. Whisk together until 100% liquid in consistency. You may need to keep mashing to get rid of all the banana chunks. Taste test batter at this point — you might want to add a splash of extra vanilla for a more prominent taste. Add two pieces of bread to bowl. Soak in batter approximately 2 minutes, then flip over and let soak again. If you can wait longer then do so — you really want the bread to soak up the batter as much as possible. Heat a splash of coconut oil in frying pan at high heat. Once it sizzles, lower heat a tad. Add both pieces of soaked bread to pan. Let cook in coconut oil. While bread is frying, let two more pieces soak. Flip bread every minute or so to ensure both sides are evenly browned and to prevent burning. Remove cooked pieces from pan, set aside, add additional coconut oil to pan and add next set of soaked bread slices to bowl. Repeat with remaining slices. Stack french toast evenly between two plates. Top with maple syrup, fresh fruit (I chose bananas and strawberries) and chia seeds — and any other toppings of your choice! Chocolate chips and coconut-based whipped cream would also be great with this. Serve warm. Makes 2 servings. We shot this video ages ago, but that’s okay because mimosas are timeless. Seriously, we’d have them with breakfast every day of the week if that was considered socially acceptable. Watch our cute lil’ video, read the recipe below, then try it out yourself! So good. Drop 5-6 frozen raspberries into each glass. This’ll do what ice does but gives the mimosa a subtle fruity taste as well. Fill champagne flutes or tall glasses halfway full with chilled champagne. The chilled part is crucial — a lukewarm mimosa? No thank you. Fill rest of flute with orange juice. Drink immediately. Makes 6-8 mimosas, depending on glass size. 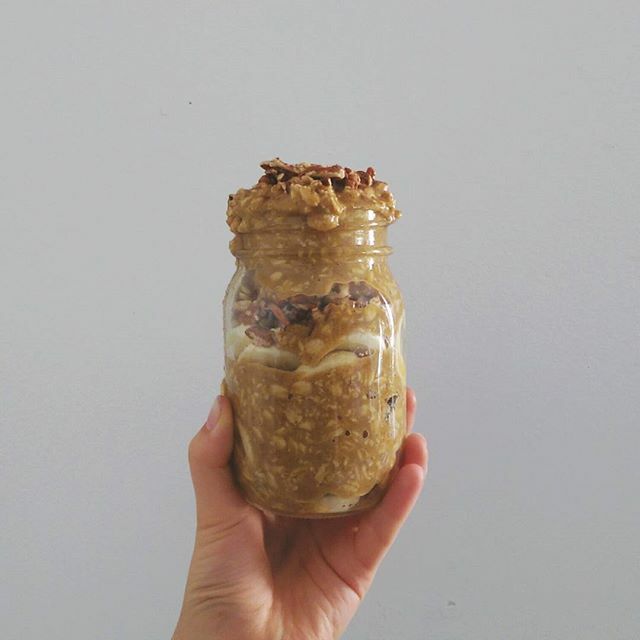 Overnight oats are a healthy (and easy) way to enjoy breakfast on-the-go! Prepare the night before, and they’ll be ready in the morning. 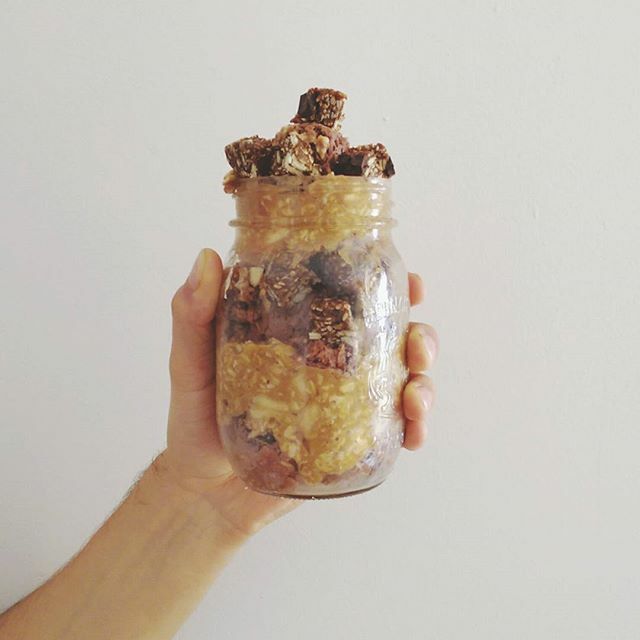 Just mix everything in a jar and leave in the fridge overnight. Top with toasted pecans and walnuts, if desired. 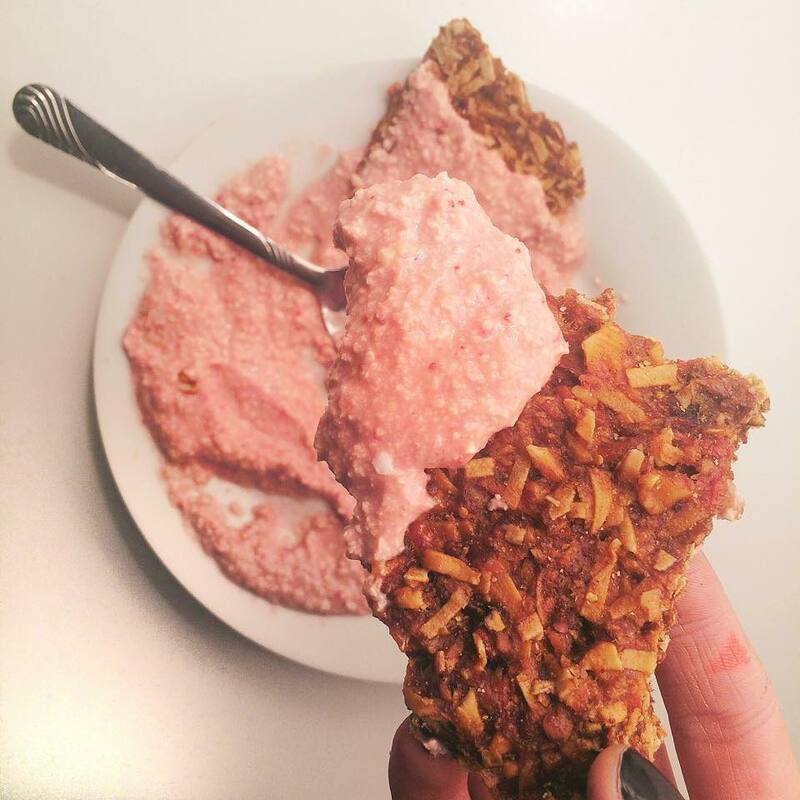 Chop up your favourite granola or snack bar to act as a topping! Serve with toasted pecans and your favourite jam! Thinking about going out for brunch this weekend? Fuhgeddaboudit! Stay in and make these in your pyjamas instead. Whisk together all dry ingredients (flour, coconut sugar and baking powder) in large bowl. 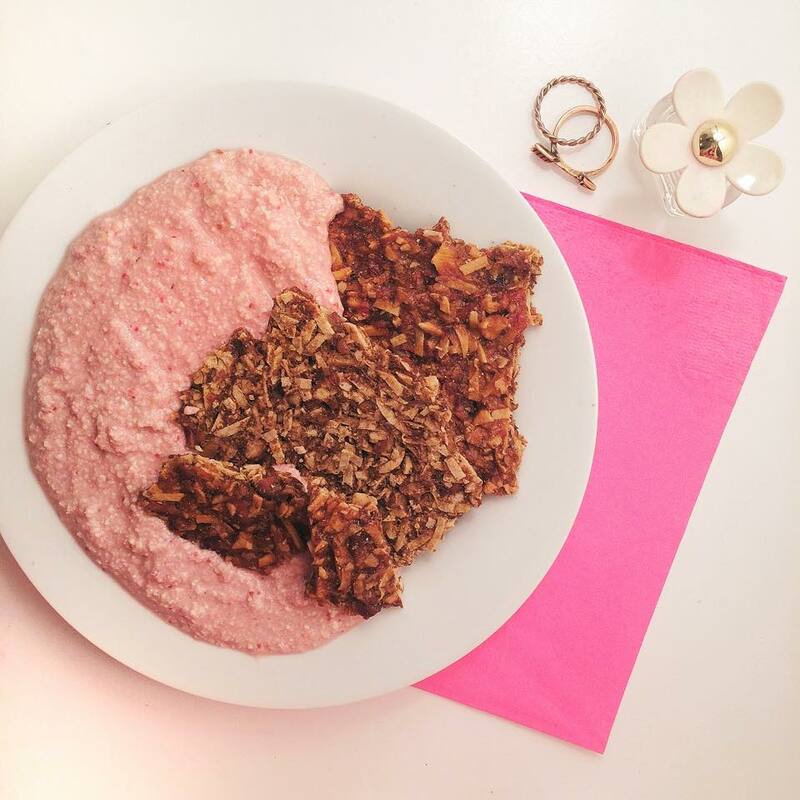 *Make flax eggs by combining 2 tbsp ground flaxseed with 6 tbsp hot water in small bowl. Set mixture aside for 5 minutes to set. Add non-dairy milk to dry mix and whisk together until smooth. Add flax and whisk until combined to thicken batter. Heat 2 tbsp coconut oil in a large frying pan on medium heat. Scoop or pour batter onto pan, using approximately 1/4 cup batter for each pancake. When brown on one side, flip and continue cooking. 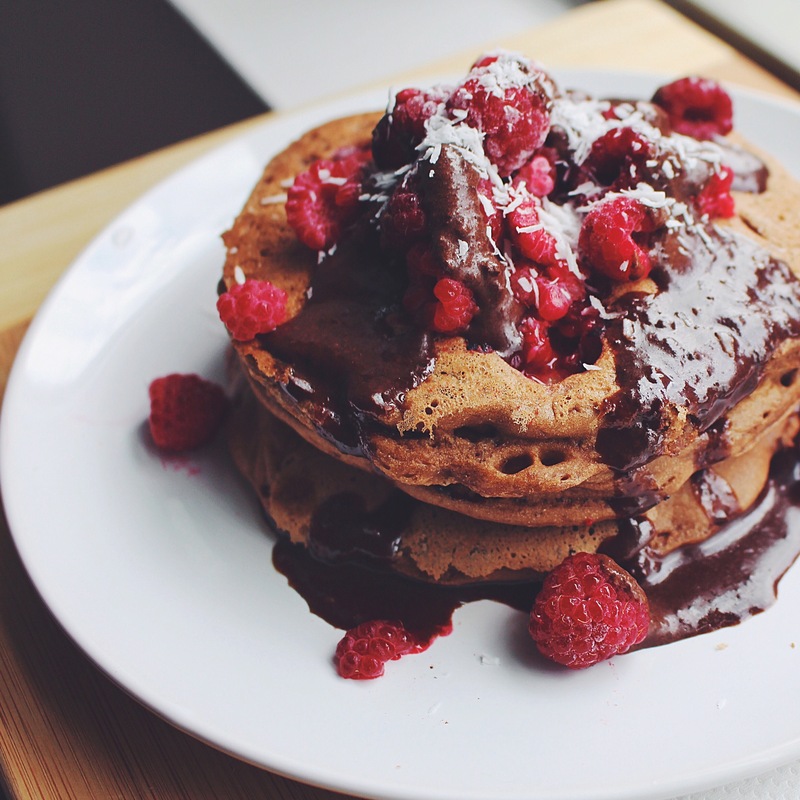 Repeat step and cook each pancake individually with remaining batter. To make chocolate sauce: Melt coconut oil in microwave or stovetop. Add maple syrup and raw cacao powder, then whisk together until smooth. Allow sauce to cool entirely. 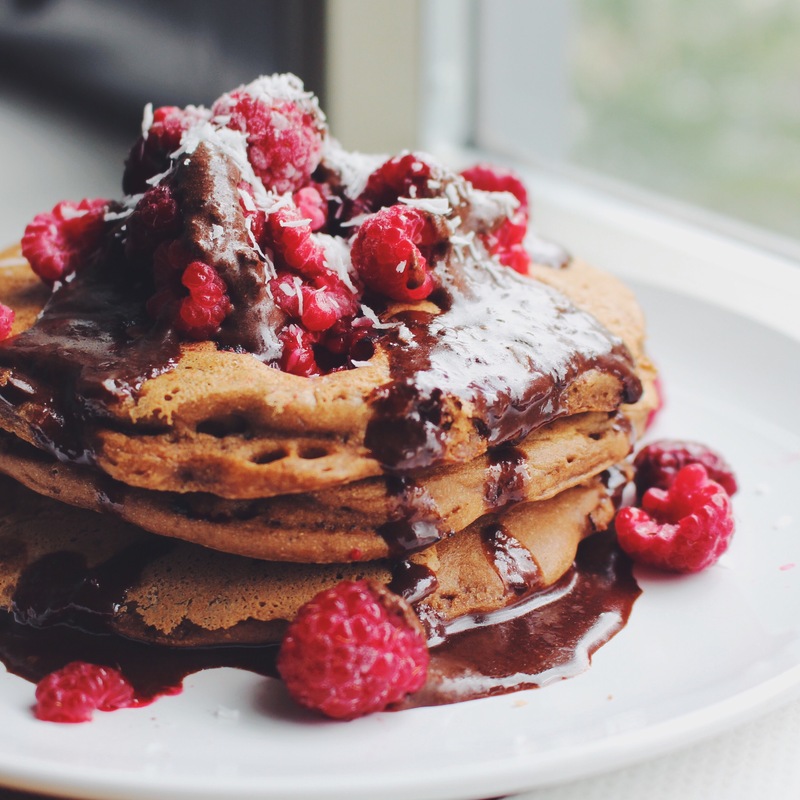 Serve pancakes hot with chocolate drizzle poured on top, as well as additional garnishes if desired (shredded coconut and fresh raspberries shown in photo). This was the first thing I devoured on Valentine’s Day morning after doing a 3-day juice cleanse! 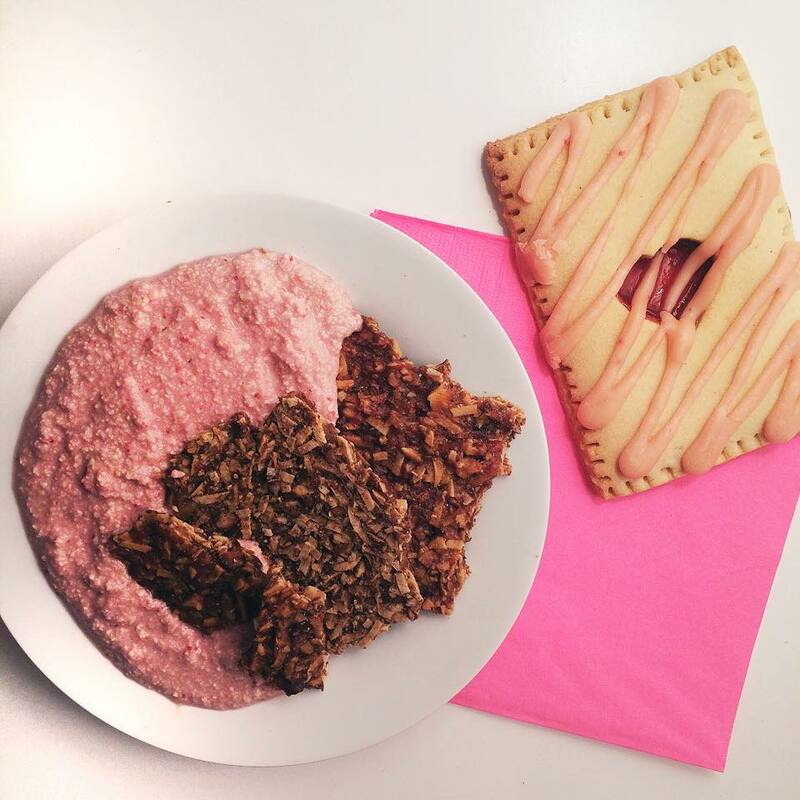 I paired this homemade strawberry cashew cream dip with some banana goji brittle from Live Organic Raw and a vanilla pop tart from Bunner’s. Combine all ingredients in a food-processor/blender until thoroughly combined. Let mixture set in freezer for 1 hour, then move to refrigerator. That’s it! Use as a spread, dip, icing, anything. Serve chilled. Keep in the fridge up to 5 days.